The UN envoy for Yemen arrived Monday in the Houthi-held capital of Sana'a, after two-day delay for logistic reasons. 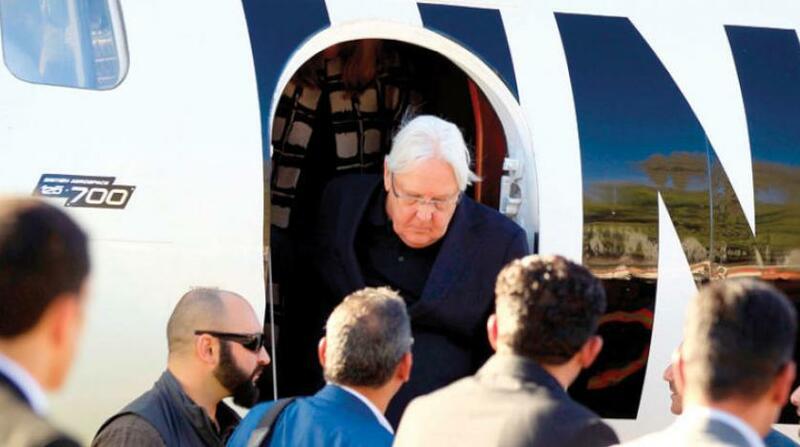 At arrival, Envoy Martin Griffiths gave no comments to reporters at Sana'a airport. Griffiths is expected to discuss with Houthi officials final arrangements for implementing the Hodeida redeployment first phase under Stockholm Agreement. Head of the Redeployment Coordination Committee (RCC), General Michael Lollesgaard, will also attend the discussions. Last week, Griffiths discussed in Muscat with Houthi senior negotiator, Mohamed Abdul Salam, Hodeida pact, setbacks facing its application and proposals to clear such obstacles. The meeting also addressed the need for accelerated fulfillment of points agreed upon in Jordan on prisoner swap, economic issue and gender participation, according to the Sana'a-based Saba news agency. Late last month, the UN envoy, via RCC head, handed the Yemeni official government and Houthi rebels a revised plan putting off discussion on the identification of local forces that would take control over areas after troop withdrawal until first phase is finished.